Yesterday’s post about my Criterion trip was lengthy enough, but I forgot one tidbit. Remember I was wearing the Ride t-shirt and the show had been the night before? 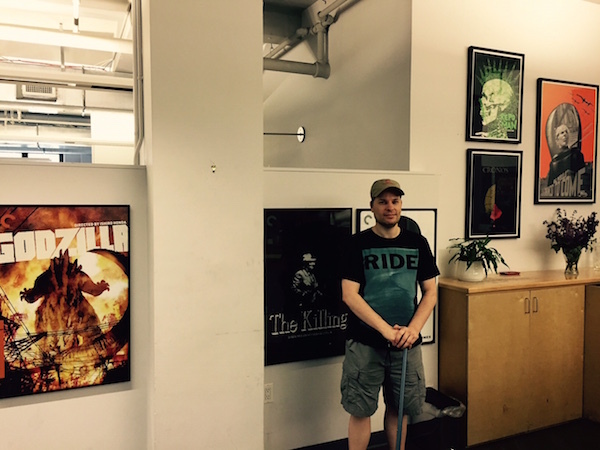 After I left the Criterion offices, I got into an elevator with a number of people. I was pretty much in a daze, reflecting on the Criterion experience, that I barely even noticed them. As I walked out of the building, someone in front of me held the door open. As I passed through, he noticed my shirt. This guy was probably about 10 years older than the Criterion Ride fan, and maybe a few years younger than myself. He was dressed in business casual, but I could see some stubble on his face. Today wasn’t a shaving day. Of course I answered yes with enthusiasm. As it turned out, he had been to the show as well, which is why he looked slightly worn out. We talked for a few moments about the highlights of the show. I was standing there with the Criterion postcards in my hand, which he then noticed. He didn’t say anything, just looked back at me. Without thinking, I asked, “do you work at Criterion?” He laughed. “I wish! I just work upstairs.” He didn’t go into more detail about his job, and I’m guessing it didn’t measure up to Criterion. We then started talking about Criterion and he learned that I was just visiting their office as a fan. He then told me some stories about just working in the building with them. He said he sees artist-types all the time, which I am guessing are sometimes directors, sometimes graphic designers, or other people associated with the industry. I could tell that while he enjoyed film, he wasn’t the foreign film devotee that I am, and wouldn’t recognize a lot of avant-garde directors, so I could not glean any secrets from him. The only guest he had ever recognized was Wes Anderson, who he had seen numerous times. That makes sense because W.A. has a distinctive look, and is arguably the biggest and most recognized American indie-auteur. With Moonrise Kingdom‘s postponed release just around the corner, I could have pressed hm for more details. I didn’t ask when the visits took place or how long he had been working there. Anderson probably visited plenty for The Fantastic Mr. Fox and The Life Aquatic because of supplements and to sign off on the releases so they could use the ‘Director Approved’ sticker. So while the news wasn’t revolutionary, it was still interesting to hear the firsthand experiences from someone who works a few floors above Criterion. When I go on a vacation, I make it a point to pack a few movies. This time I packed four Criterion discs. Guess how many I watched? Absolutely none. I watched a light classic movie on the plane, and that was it. That speaks to the fact that we had such a packed trip. After doing the podcast, seeing a concert and visiting Criterion, I was just either too excited or too exhausted to pour my energy and concentration into an art film. I happened to have completed Modern Times and all of its supplements before leaving town, and was hoping to finish writing my post on the airplane or in the hotel. That didn’t happen either. I tried a few times, but found my idle time too distracted with twitter, email, or whatever. 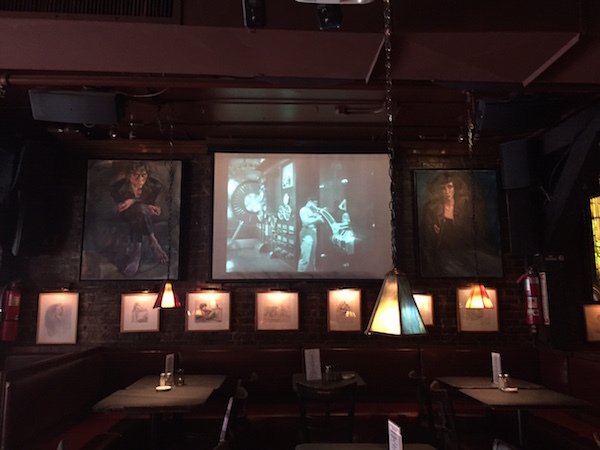 Since I have this mammoth ongoing project in process, I sometimes felt guilty for neglecting my ‘responsibilities.’ As fate would have it, we were in a restaurant yesterday and they were playing Chaplin films. Great idea! We watched and laughed at a silent Chaplin as we ate, which ended about the time we were paying our check. As you can see from the image above, the next movie was Modern Times. We left right after I took the above picture, but I found it an eerily coincidental reminder. Expect that post up within the next couple of days as I get re-settled into town. The guys over at CriterionForum found a phantom page for Samantha Fuller. Could this mean that Pickup on South Street is going to be reissued on Criterion? Could this mean that another Fuller title is forthcoming? Maybe a box-set? The sleuths at CriterionForum have concluded that this is indeed for Pickup. I hope they are right. What James brought up about Sam Fuller on the podcast was fascinating and I would love to learn more about the man, and of course I’d be eager to revisit this restored classic again from my home theater. My guess is we’ll know something in a few weeks or months. Posted on June 7, 2015, in Blog, Film. Bookmark the permalink. Leave a comment.